A short account of the South Korean strike wave of 1987 known as the Great Workers' Struggle. Affecting most major industries and involving over a million workers, the strikes and militant tactics used won significant gains in pay and conditions for many. The workplace struggles that took place in 1987 occurred within the wider background of political reform. For thirty years South Korea had been ruled by a military dictatorship, and growing calls for democracy had echoed across the peninsula through the 1970s and early 80s. Street demonstrations calling for Korea's military rulers to accept opposition demands for democratisation, including constitutional reform and presidential elections took place in May, and gained further ground in early June when the government abruptly called off negotiations with opposition leaders. Intensified by news of the death of a student demonstrator in police custody due to torture, and of the sexual assault of a female student labour activist by a police interrogator, the protests grew to massive proportions by mid-June, mobilising not only opposition activists but also large numbers of students, white collar workers, shopkeepers and industrial workers. The sight of hundreds of thousands marching in the streets proved a disquieting sight for the government, and on June 29 Roh Tae Woo, chairman of the ruling Democratic Justice Party (DJP), announced that presidential elections were to take place and constitutional amendments would be granted. What happened next was an explosion of industrial protest and strikes on a scale unseen before in South Korea. Within two weeks of the government's declaration, major strikes and demonstrations had broken out in several southern coastal cities. From the vast industrial estates of Ulsan, strikes quickly spread westwards along the coast to other major centres of heavy industry; Pusan, Changwong and Masan, and within a month major strikes were flaring up in the northern cities of Inchon and Seoul. By the end of August the entire country had been brought to a halt by this unprecedented strike wave. Strikes shut down production at many large firms, including Daewoo, Hyundai, Kia, Samsung and Lucky-Goldstar, a large South Korean conglomerate. Bus and taxi drivers struck in their thousands in Kwangju, Chonju, Kunsan, Okku and Kimje, as well as Seoul. Fishermen struck in coastal areas, and in Pusan succeeded in shutting down the city's central fish market. 20,000 miners from thirty-two pits were on strike by mid-August, costing the country nearly half its national coal output. Miners frequently clashed with police, occupied buildings, including a train station in the town of Taebaek, and company buildings at a number of pits were burned. Hyundai workers were often the most militant, clashing with police throughout July and August and often occupying shipyards and factory buildings. The southern island of Geoje also witnessed particularly violent scenes during a large strike by Daewoo shipyard workers, during which a 22-year old worker, Lee Sok Kyu, was killed after being struck by fragments of an exploding tear gas grenade. Lee's death sparked an escalation of violence on the island, with workers occupying the local hospital where his body was held and attacking a hotel where Daewoo managers were believed to be staying. At its height, the strike wave involved some 1.2 million workers, or about a third of the regularly employed workforce, and affected most major industries, from mining, manufacturing, the dockyards to transportation and the service sector. A hundred labour disputes were occurring daily, and by the end of the year the country had seen 3,749 strikes, exceeding the total number of strikes that had occurred since the early 1960s. In 1986, there had only been 276 recorded strikes. As most of the walkouts had been purely spontaneous and unorganised on a large scale, the vast majority of workers were effectively on strike illegally. Required cooling-off periods and other legal mandates had been ignored, and the illegal nature of the strikes was reflected in the tactics adopted by many workers. Large street demonstrations organised by workers and supporters often turned violent, workers clashed frequently with the police, company buildings and factories were occupied, managers were taken hostage and particularly cruel foremen were beaten up. These tactics reflected the many years of abuses suffered by workers, off whose backs the 'economic miracle' of South Korea had been built. This pent-up resentment was displayed in the long lists of common demands made by workers. Low pay was endemic in South Korea, and the average hourly wage across industries was at $1.75, compared to $13.09 an hour for manufacturing workers in the United States. Koreans also suffered from an average 57-hour week, one of the longest in the world. Demands for 25-60 percent wage increases were common, as well as for shorter working hours. Ranked alongside demands for higher pay, workers also called for improvements to the disciplined, almost militaristic way of life within the factories, including improvements in the quality of meals, ending of strict restrictions on dress and hair styles, ending of compulsory morning exercises, abolition of distinctions between factory workers and office staff, and the termination of evaluation systems by foremen. Central also to the struggle was the issue of representation; many company unions were taken over, and thousands of new democratic unions were founded. By the end of 1988 over 3,400 new unions had been formed across the country. Unlike previous mass labour struggles in South Korea which had mainly taken place in the light manufacturing sector, the strikes of 1987 found their main base amongst workers in heavy industry, especially in Ulsan, the centre of Hyundai's operations in South Korea. Within a week of the DJP's reform declaration, workers at several Hyundai firms in Ulsan formed unions. Taking the lead from a small group of workers at Hyundai Engine, workers at twelve other Hyundai firms had founded unions of their own within a month. The formation of unions was thoroughly opposed by management, but, undettered, Hyundai workers began to list their demands to employers, including a 25-30 percent wage increase. On August 8, workers' representatives from twelve newly-unionised Hyudai firms founded the Council of Unions of the Hyundai Group. After receiving a hostile response from Hyundai management, the group organised a mass march in Ulsan to reinforce their demands. Nine days later, workers marched from the gates of Hyundai Heavy Industries towards the centre of the city, led by dump trucks, fire engines, forklifts and sand-blasting machines. The march was attacked by riot police who fired tear gas into the crowd, but, due to far superior numbers, the police soon found themselves overwhelmed and fleeing from pursuing workers. Kwon Yong-mok, elected chair of the Council of Unions, met with the police chief of Ulsan and negotiated a marching route, and after walking some three kilometers into the city, the protesters peacefully turned around and returned to Hyundai Heavy Industries. A second, much larger demonstration took place the next day, with around 40,000 workers marching with their wives and children to Ulsan Sports Stadium. Again led by heavy vehicles, the workers at the front of the march had prepared themselves with hard hats and gas masks; although their numbers alone were enough to force a retreat of the 4,500 police awaiting them at the stadium. Following a meeting with government representatives inside the stadium, it was announced that all the workers' demands had been accepted, including the recognition of their union. Despite the agreement, continued resistance from some Hyundai firms guaranteed further resistance from workers. Violent clashes continued through September, especially at Hyundai Heavy Industries, where 20,000 striking shipyard workers were repeatedly attacked by police. 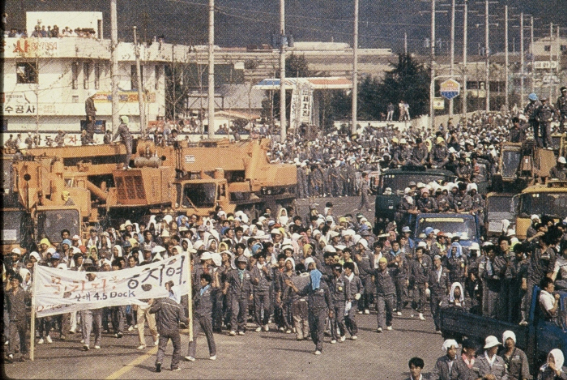 The firm was also hit by a bitter 128-day strike, the longest in South Korean history, at the end of 1988. Strikes continued throughout the year, but the movement hit its peak in August. Millions of workers had been on strike, occupied their workplaces and shown their determination to win through militant struggle. Many, if not the majority, of strikes were successful, with workers achieving significant improvements to their conditions, and much-needed wage increases, in some cases up to 60 percent. Democratic unions had been founded, although many were to be later undermined by government repression. The pressure built up during the harsh years of military dictatorship and economic boom had been released. But possibly the most important aspect of the experiences of 1987 was the effect they had on the wider working class, increasing the confidence of many workers in using collective action to secure their goals. Whereas the majority of large strikes before 1987 had been carried out by minorities of workers, the Great Workers' Struggle brought together large sections of the working class in their shared aims, and cleared the way for further struggles during the next three years. Millions of workers had been on strike, occupied their workplaces and shown their determination to win through militant struggle. Many, if not the majority, of strikes were successful, with workers achieving significant improvements to conditions and wage increases of up to 60%.